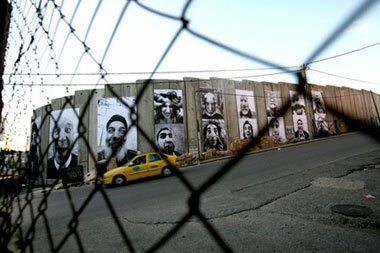 The Face2Face project has photographed Palestinians and Israelis and posted their portraits "in huge formats, in unavoidable places", on the Israeli and the Palestinian sides of the separation barrier. As you can see from the photos the results are very impressive in situ and I think they go some way to exploring the shared humanity of the two peoples divided by the conflict. The short 'making of' film on the Face2Face site is worth a look.